If Alexandria was late to develop a distinctive philosophy, she was early prominent as a great factory and exchange of religious ideas. The Museum and Library represented only one of the three sides of the triple city of Alexandria. They represented the Aristotelian, the Hellenic, and Macedonian element. But Ptolemy I had brought together two other factors to this strange centre. First there was a great number of Jews, brought partly from Palestine, but largely also from those settlements in Egypt which had never returned to Jerusalem; these latter were the Jews of the Diaspora or Dispersion, a race of Jews who, as we have already noted in Chapter XIX, had not shared the Babylonian Captivity, but who were nevertheless in possession of the Bible and in close correspondence with their co-religionists throughout the world. These Jews populated so great a quarter of Alexandria that the town became the largest Jewish city in the world, with far more Jews in it than there were in Jerusalem. We have already noted that they had found it necessary to translate their scriptures into Greek. And, finally, there was a great population of native Egyptians, also for the most part speaking Greek, but with the superstitious temperament of the dark whites and with the vast tradition of forty centuries of temple religion and temple sacrifices at the back of their minds. In Alexandria three types of mind and spirit met, the three main types of the white race, the clearheaded criticism of the Aryan Greek, the moral fervour and monotheism of the Semitic Jew, and the deep Mediterranean tradition of mysteries and sacrifices that we have already seen at work in the secret cults and occult practices of Greece, ideas which in Hamitic Egypt ruled proudly in great temples in the open light of day. These three were the permanent elements of the Alexandrian blend. But in the seaport and markets mingled men of every known race, comparing their religious ideas and customs. It is even related that in the third century B.C. Buddhist missionaries, came from the court of King Asoka in India. Aristotle remarks in his Politics that the religious beliefs of men are apt to borrow their form from political institutions, «men assimilate the lives no less than the bodily forms of the gods to their own», and this age of Greek-speaking great empires under autocratic monarchs was bearing hardly upon those merely local celebrities, the old tribal and city deities. Men were requiring deities with an outlook at least as wide as the empires, and except where the interests of powerful priesthoods stood in the way, a curious process of assimilation of gods was going on. Men found that though there were many gods, they were all very much alike. Where there had been many gods men came to think there must be really only one god under a diversity of names. He had been everywhere under an alias. The Roman Jupiter, the Greek Zeus, the Egyptian Ammon, the putative father of Alexander and the old antagonist of Amenophis IV the Babylonian Bel-Marduk, were all sufficiently similar to be identified. «Father of all in every age, in every clime adored By saint, by savage and by sage, Jehovah, Jove or Lord». Where there were distinct differences, the difficulty was met by saying that these were different aspects of the same god. Bel- Marduk, however, was now a very decadent god indeed, who hardly survived as a pseudonym; Assur, Dagon, and the like, poor old gods of fallen nations, had long since passed out of memory, and did not come into the amalgamation. Osiris, a god popular with the Egyptian commonalty, was already identified with Apis, the sacred bull in the temple of Memphis, and somewhat Confused with Ammon. Under the name of Serapis he became the great god of Hellenic Alexandria. 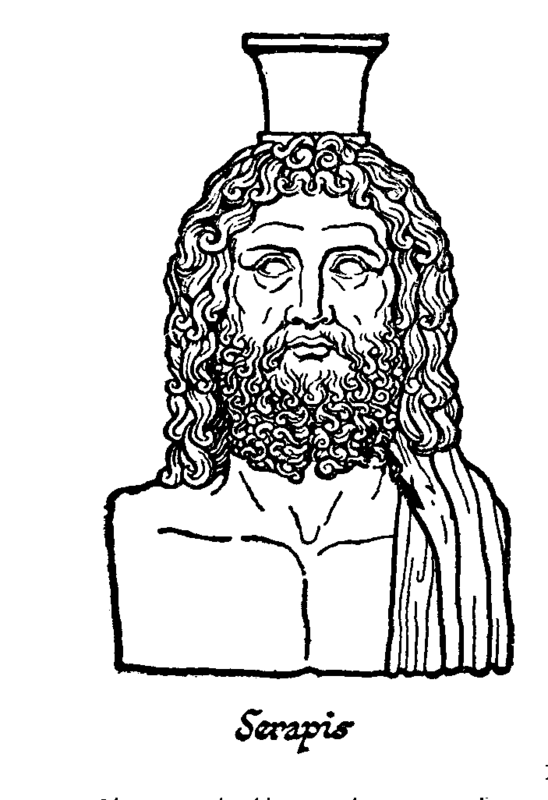 He was Jupiter- Serapis. 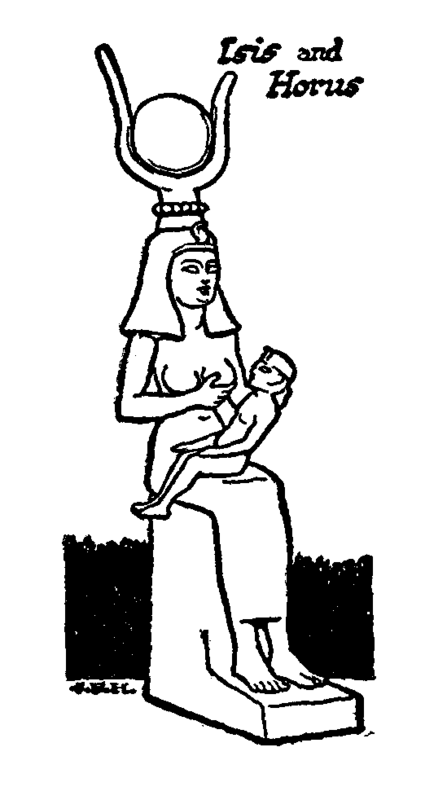 The Egyptian cow goddess, Hathor or Isis, was also represented now in human guise as the wife of Osiris, to whom she bore the infant Horus, who grew up to be Osiris again. These bald statements sound strange, no doubt, to a modern mind, but these identifications and mixing up of one god with another are very illustrative of the struggle the quickening human intelligence was making to cling still to religion and its emotional bonds and fellowship, while making its gods more reasonable and universal. This fusing of one god with another is called theocrasia, and nowhere was it more vigorously going on than in Alexandria. Only two peoples resisted it in this period: the Jews, who already had their faith in the One God of Heaven and Earth, Jehovah, and the Persian who had a monotheistic sun worship. It was Ptolemy I who set up not only the Museum in Alexandria, but the Serapeum, devoted to the worship of a trinity of god which represented the result of a process of theocrasia applied more particularly to the gods of Greece and Egypt. This trinity consisted of the god Serapis (== Osiris + Apis), the goddess Isis (== Hathor, the cow-moon goddess), and the child god Horus. In one way or another almost every other god was identified with one or other of these three aspects of the one God, even the sun god Mithras of the Persians. And they were each other; they were three, but they were also one. They were worshipped with great fervour, and the jangling of a peculiar instrument the sistrum, a frame set with bells and used rather after the fashion of the tambourine in the proceedings of the modern Salvation Army, was a distinctive accessory to the ceremonies. And now for the first time we find the idea of immortality becoming the central idea of a religion that extended beyond Egypt. Neither the early Aryans nor the early Semites seem to have troubled very much about immortality, it has affected the Mongolian mind very little, but the continuation of the individual life after death had been from the earliest times an intense preoccupation of the Egyptians. It played now a large part in the worship of Serapis. In the devotional literature of his cult he is spoken of as «the saviour and leader of souls, leading souls to the light and receiving them again». It is stated that «he raises the dead, he shows forth the longed-for light of the sun to those who see, whose holy tombs contain multitudes of sacred books»; and again, «we never can escape him, he will save us, after death we shall still be the care of his providence». In this worship of Serapis, which spread very widely throughout the civilized world in the third and second centuries B.C., we see the most remarkable anticipations of usages and forms of expression that were destined to dominate the European world throughout the Christian era. The essential idea, the living spirit of Christianity was, as we shall presently show, a new thing in the history of the mind and will of man; but the garments of ritual and symbol and formula that Christianity has worn, and still in many countries wears to this day, were certainly woven in the cult and temples of Jupiter, Serapis, and Isis that spread now from Alexandria throughout the civilized world in the age of theocrasia in the second and first centuries before Christ.